Thanks for visiting this stop on the Crossley ID Guide Blog Tour! I hope you’ll enjoy this look at some raptors I have come to know personally. Check out the bottom of this post to find a chance to win a signed copy of The Crossley ID Guide: Raptors. 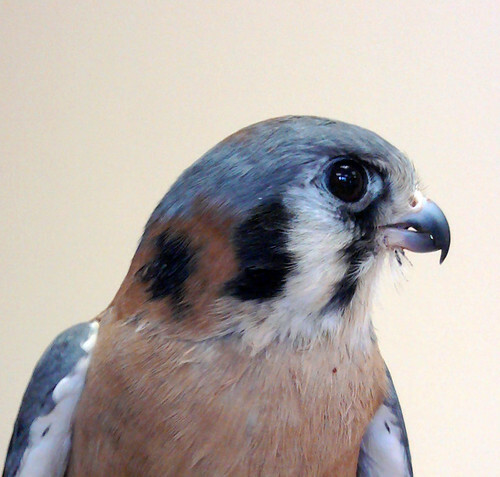 This is Darwin, a male American Kestrel. He is imprinted on humans and cannot be released into the wild. Darwin is the first bird of prey I got to meet up close and personal. It is always a joy for me to be able to handle a bird of prey on the glove like this. To see and study Darwin’s feathers up close is really special, and something I also love to be able share with others. During informal education programs, I have been able to talk with members of the public about birds like Darwin and the others in this post. I always hope that the time I spend sharing these raptors with interested people results in a positive impact on them and their outlook on birds, wildlife, and the environment in general. Hopefully they come away with a new appreciation for birds — and they will seek them out in their future outdoor adventures. 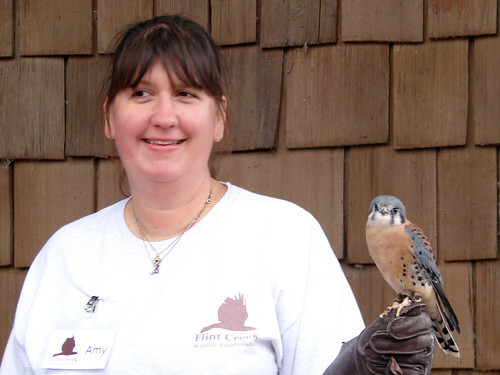 American Kestrels are found in both locations where I have had them in programs (northern Illinois and central Florida). Sometimes people are surprised to learn that these beautiful little raptors are indeed native to where they (the people) live, and that kestrels aren’t too hard to find. I love telling people where to look for kestrels and how to identify them. This is Zen, a male Cooper’s Hawk. He has a permanent injury to his right wing, making him unreleasable. 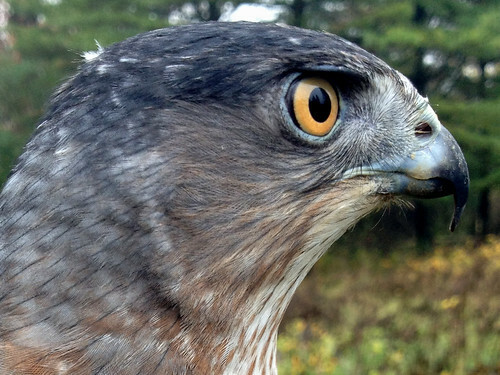 Cooper’s Hawks are notoriously high-strung — as bird-eaters (and so bird-chasers!) it is just in their nature. So Cooper’s Hawks are not often glove-trained. Bringing Zen to a program is always special. Cooper’s Hawks are common visitors to back yard bird feeding stations, but people sometimes overestimate their size. So it’s especially fun to share beautiful Zen with back yard birders. This is Picasso. 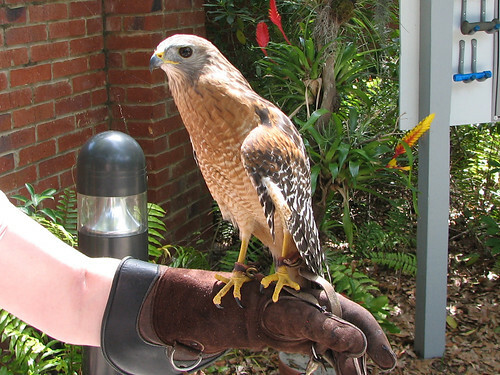 Picasso is a male Red-shouldered Hawk, and I have not yet had the pleasure to handle him. I hope that will change soon! Picasso is missing his right eye, and has a permanent injury to his left wing. Red-shouldered Hawks are abundant here in Florida. Even though they are common, people are sometimes surprised to learn some of their basic facts: they are monogamous; females are larger than males (as with most birds of prey); they typically weigh no more than 1.5 lb. This lovely female Red-tailed Hawk is named 0511. She is also an imprint; she was found begging for food while perched on a car mirror as a juvenile bird. She is the first Red-tailed Hawk I was able to hold on the glove. It is fun to speak with the public with 0511 on the glove. People relate to her, since Red-tailed Hawks are quite common. She is mostly correctly identified by passers-by — especially if I turn her around so her beautiful tail is visible. 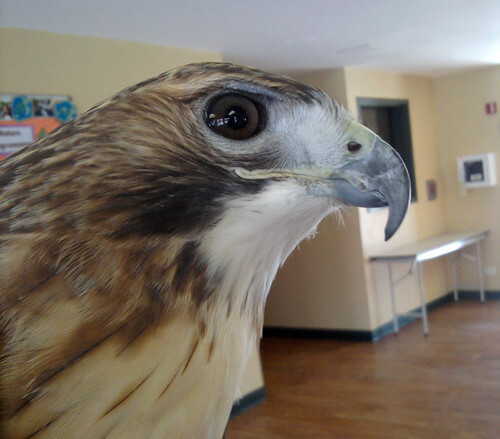 During programs, lots of people want to share their own stories about seeing Red-tailed Hawks in the wild. 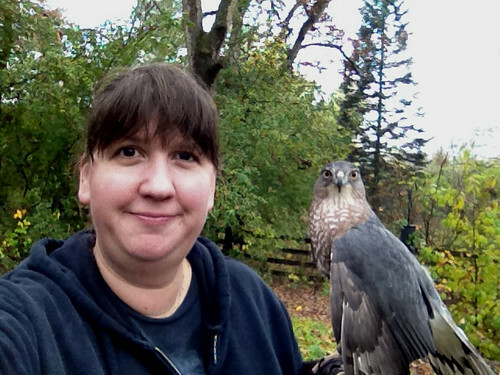 It is always fun to hear of their encounters, answer their questions, and encourage them to love raptors as much as I do. These are just a few of the raptors I have been able to meet up close and share with others. Of course, I love them all! Thanks to Princeton University Press, I am excited to announce that I have a signed copy of The Crossley ID Guide: Raptors to give away to one lucky reader! To enter, just leave a comment on this post below. Be sure to include a valid email address where you can be reached in case you win the random drawing. I will use a random name selector to pick the winner on Wednesday, March 27th, so please have your comment entry posted by 12 midnight EDT Tuesday, March 26th. And after you’ve left your comment, be sure to visit the other great blogs participating in the raptor love-fest known as The Crossley ID Guide Blog Tour! The blog tour wraps up with a fun live online event on Friday. Click to learn more about the Raptor Happy Hour Shindig Event! Thanks again to my readers for visiting this post. And a big THANK YOU to Jessica Pellien at Princeton University Press for arranging this mega raptorfest blog tour! maintain the ecological character of their Wetlands of International Importance and to plan for the “wise use”, or sustainable use, of all of the wetlands in their territories. As of today, there are 2,040 recognized sites designated by the treaty as Wetlands of International Importance. 34 of these are in the United States, including the Sue and Wes Dixon Waterfowl Refuge at Hennepin & Hopper Lakes. The deserved designation was bestowed in February of this year, and a special dedication ceremony will take place on August 8th. The public is invited to attend the event, which is free. Attendees should RSVP to organizers; contact information and other details may be found here: Upcoming Events Ramsar Site Dedication. The annual Bald Eagle Watch at Starved Rock State Park is coming up later this month. I am posting this as a public service to all of the visitors who land on my blog looking for updated information about this event. You can find the details on the Illinois Audubon Society site, or read on. 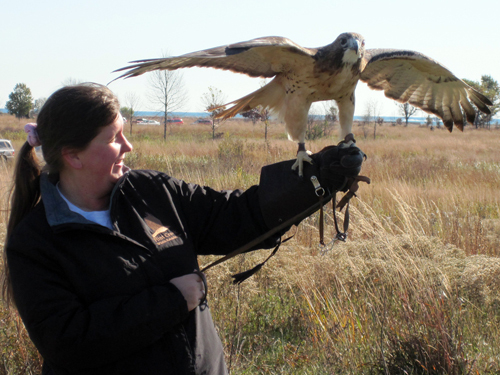 Events include live raptor programs by the World Bird Sanctuary and the Illinois Raptor Center. There will be other vendors and programs at the event, which takes places at the two different spots noted in the map below. 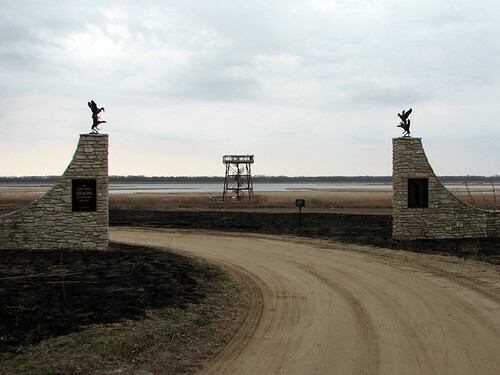 The Illinois Waterway Visitor Center is north of the river; Starved Rock is to the south. See the IAS Bald Eagle Watch Brochure for other events and further details. I’m sad I can’t attend this wonderful event this year. If you go, be sure to keep your eyes peeled for young Bald Eagles sporting leg bands!